Rare and original, 1863 Letter manuscript Civil War Soldier's Letter sent from Fort Pickering, Memphis, Tenn. It was written by Private Joseph Gruver of the 75th Regiment Illinois Infantry, Company H. This wonderful Civil War Soldier's Letter is dated January 30th, 1863 and was written by Private Joseph Gruver of the 75th Regiment Illinois Infantry to his a Friend in Vandalia, Illinois named Alfred Griffith. The letter is written on a four page letter sheet which measures approx. 5 1/2" by 9" - the manuscript covers three full pages and half of the last page. The Letter talks about men being killed, Confederate Prisoners being brought in every day and the life of a U S Army private in Western Tennessee. The Letter reads as follows. I take the present opportunity writing you a few lines to let you know that I received your letter today and was glad to hear that you were all well. I don't think there is a man in our regiment but what has had the Diarea(sic) more or less. We buried one of our men today. The first what has died in our Com. There has only nine died out of regiment since we have been out. We have had very rainy weather for the last three or four weeks but it has cleared off now and looks like we will have a spell of weather yet if it don't rain any more. You said you was having a fine time at the Schoolhouse. I don't think that we will leave here during the war by all appearances. There was some talk of us going North again but that has played out. There was a part of our force had a skirmish with some guarillas(sic) yesterday about 5 miles from here. There was two of our men killed and about thirty of the Secesh. We heard firing this evening but have not heard from them yet. There is prisoners brought in nearly every day. It is hard but it is honest. Tell William I want him to write to me not hold off for me to write first and for him to write and I will answer. It does me good to get a letter from any body. I have not got two letters since I have been here and I have written more than a dozen since I have been here. I have very near run out of post stamps. They are mighty hard to get here. I must close for tonight. Give my love to all the friends and think of me when you are having good times with the girls in particular and just _____ up to the school trips for me. No more but remain your friend. The 75th Illinois Volunteer Infantry was an infantry regiment that served in the Union Army during the American Civil War and saw extensive action. The Regiment was organized at Dixon, Ill. And mustered in September 2, 1862. Left state for Jeffersonville, Ind. Attached to 30th Brigade, 9th Division Army of the Ohio, to October, 1862. 30th Brigade, 9th Division, 3rd Corps, Army Ohio, to November, 1862. 1st Brigade, 1st Division, Right Wing 14th Army Corps, Army of the Cumberland, to January, 1863. 1st Brigade, 1st Division, 20th Army Corps, Army of the Cumberland, to October, 1863. 3rd Brigade, 1st Division, 4th Army Corps, to June, 1865. Pursuit of Bragg, into Kentucky October 1-16, 1862. October 16-November 7, and duty there till December 26. Wilson's Creek Pike December 25. Advance on Murfreesboro December 26-30. Nolensville, Knob Gap, November 26. Battle of Stone's River December 30-31, 1862, and January 1-3, 1863. Reconnoissance from Salem to Versailles March 9-14. Operations on Edgeville Pike June 4. Middle Tennessee or Tullahoma Campaign June 24-July 7. Occupation of Middle Tennessee till August 16. Passage of Cumberland Mountains and Tennessee River and Chickamauga Ga. Guard supply trains over mountains in rear of Bragg's army during battle of Chickamauga. Siege of Chattanooga September 24-November 23. Reopening Tennessee River October 26-29. Taylor's Ridge, Ringgold Gap, November 27. March to relief of Knoxville November 27-December 8. At Whitesides, Tyner's Station and Blue Springs till May, 1864. Tunnel Hill, Rocky Faced Ridge and Buzzard's Roost Gap February 23-25. Demonstration on Rocky Faced Ridge May 8-11. Buzzard's Roost Gap May 8-9. Demonstration on Dalton May 11-13. Battle of Resaca May 14-15. Advance on Dallas May 22-25. Operations on line of Pumpkin Vine Creek and battles about Dallas, New Hope Church and Allatoona Hills May 25-June 5. Operations about Marietta and against Kenesaw Mountain June 10-July 2. Assault on Kenesaw June 27. Ruff's Station, Smyrna Camp Ground, July 4. Peach Tree Creek July 19-20. Siege of Atlanta July 22-August 25. Flank movement on Jonesboro August 25-30. Battle of Jonesboro August 31-September 1. Operations against Hood and Forest in North Georgia and North Alabama September 29-November 3. Columbia, Duck River, November 24-27. Battle of Franklin November 30. Battle of Nashville December 15-16. Pursuit of Hood to the Tennessee River December 17-28. And duty there till March, 1865. Expedition to Bull's Gap and operations in East Tennessee March 15-April 22. And duty there till June. Mustered out at Nashville, Tenn. June 12, and discharged at Chicago, Ill.
Regiment lost during service 3 Officers and 94 Enlisted men killed and mortally wounded and 5 Officers and 103 Enlisted men by disease. This very rare, original Civil War Soldier's Letter is in very good condition. The handwriting is somewhat light but neat and legible and the sheet generally clean but with some toning on the fold lines and some small and scattered spots of foxing. 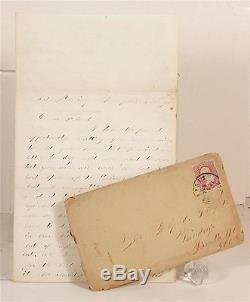 A rare and fascinating, original 1863 manuscript Civil War Soldier's letter and a fantastic addition to any collection!! And Click Here to Add Us To Your Favorite Sellers List. Click Here to Discover More About this Item and Many Others on Our New Informational / Non-Commercial / Reference Blog - Walnutts. The item "1863 CIVIL WAR SOLDIER'S LETTER WITH EXCELLENT CONTENT FROM TENNEESEE" is in sale since Friday, August 07, 2015. This item is in the category "Collectibles\Militaria\Civil War (1861-65)\Original Period Items\Correspondence, Mail".